The city of Oaxaca (formally: Oaxaca de Juárez, in honor of 19th-century president and national hero Benito Juárez, who was born nearby) is the capital and largest city of the Mexican state of the same name (pronounced wa-HA-ka in English). The city of Oaxaca is located in the Valley of Oaxaca in the Sierra Madre del Sur Mountains about 500 km southeast of Mexico City on an arid highland plateau some 1700 meter above sea level. Oaxaca is a fairly big city with over half a million inhabitants, but it is still quite a relaxed city, unpretentious and friendly. The old inner city has many good examples of baroque colonial architecture dating from the 16th century. In Oaxaca you will find Mexico's most splendid churches, some of its finest museums, and dozens of well preserved municipal and religious buildings from the colonial era. 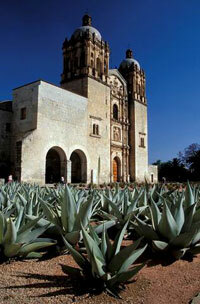 And with a climate that is spring-like and pleasant year round you can be sure Oaxaca is a good destination. The province of Oaxaca is one of the least developed regions in Mexico. This means that when you visist smaller towns in the area you might be looked upon with suspicion. The upside for you as a traveler is that lodging and dining in Oaxaca are remarkably affordable. Whatever the region lacks in resort swankiness, it more than makes up for with its quaint inns and comfortable hotels. Native cuisine is outstanding, and the region is home to mezcal, a fiery native liquor similar to tequila. Oaxaca is a major tourist destination, and also known for there many festivals Major festivals including dia de los muertos (day of the dead) and noche de los rabanos (night of the radishes) or the largest festival of dance and music in the state, the Guelaguetza, a major attraction for regional, national, and international tourists that is put on annually at a stadium built for the purpose overlooking the city of Oaxaca.The area around Oaxaca is also rich with archaeological sites, of which about 800 have been surveyed. The area's main attractions are the majestic sites of Monte Alban, Mitla, and Yagul. Each lies within a 25 mile radius of Oaxaca City. Today, declared a World Heritage Site by UNESCO, Oaxaca shimmers as the home of some of Mexico's finest artists. The black pottery fashioned by its artisans is prized throughout the world. Gourmets laud the local gastronomy, especially the mole sauces, and some say Oaxaca mezcal is better even than tequila.